Note: I am aware I’ve been wasting my time more than usual, but I couldn’t resist the siren call of one of my old loves: Diablo. I wrote a big spiel on the state of the game and thought I might as well post it here for that one guy who stumbles in via Google. Enjoy (?). Visiting the official Diablo 3 forums will give you a smorgasbord of grievances that the most vocal section of the player base has with Reaper of Souls. Demands range from changing the drop system to implementing PvP to simply remaking D2. One of the more interesting ideas that is sometimes discussed is the concept of ‘progression. I think that it has many merits for discussion and would like to extrapolate on some big ideas. Full disclosure: In the field of game design I am neither a professional nor an academic. I simply some guy who enjoys thinking about and discussing stuff. This ‘study’, as I have arrogantly titled it, will mostly just be a looking at various other game titles as a compare and contrast exercise. Diablo 2 will obviously make an appearance, but not necessarily in that ‘this is why D2 was better nah’ sort of way. Our main objective is to draw out some principles. Firstly, some definitions. When I talk of progression in games I refer mostly to a feeling of forward momentum towards an achievable goal. Much of gameplay is about progression; the allure of games often comes from the definite sense of accomplishment that is so elusive in real life. If solve a problem, you get rewarded. Inversely, if you want a certain reward, you can work towards it. Consider the continual prevalence of puzzles, the introduction of RPG elements into every genre, and those ubiquitous unlockable ‘Achievements’. Those all feed, in different ways, that part of your brain that enjoys carrots in the carrot and stick equation. Progression is like a trail of carrots that you can actively follow. 1. Progression of character levels. 4. Progression of player skill. Progression of character levels is an easy one that has been integrated into almost all genres of gaming. It is a very stable progression system; exp comes in steady streams and can almost be used as a measure of how long you’ve played. Note that it’s very rarely just about filling a bar; experience is often used to unlock new content, whether it’s gaining more stats to tackle harder content or unlocking new skill options. It’s a tried and true system that’s proven to be so addictive that some game even split experience into two parts: one for gaining stats and one for gaining skills. Experience is great. You can even gain EXP in Starcraft these days. Everyone loves it. Progression of gear is a secondary system that supplements and creates tensions with other progression systems. Whereas experience and levels offers slow and steady progression, gear is allowed to be more flexible, and can either come at regular intervals (get money from battles, find next town, buy upgrades) or in sharp bursts (find something awesome in a dungeon). Gear is often worth a large amount of levels for the purposes of accessing harder content. In that kind of system experience acts as a sort of fallback mechanism that allows you to ‘out-level’ the content (and reach areas offering more money/better gear). Progression of plot runs parallel to progression of levels and gear, but is also fed by them in some ways. As you play through the game you get to see more of the story. That’s obviously hardly just a gaming thing. However only in games do they make you work for your story. This is where gear and levels play into it. Often one needs to visit increasingly difficult areas to access more of the story, which is what levels and/or gear is required for (note, however, the modern trend of having ‘casual’ difficulties in games). Increasing the tension between these systems are ‘side-quests’ which often offer exp/gear rewards but no plot progression. I leave progression of player skill for last because it’s a) hard to measure and b) hardly emphasised in most RPGs. The skill ceiling of most RPGs, even action RPGs, are often relatively low. This is in part because we already have other progression systems (that’s levels and gear again) that reduces the need for player skill. Not that there isn’t any–like recognising attacks and patterns, using the right strategy for hard fights, resource management–but it’s comparatively understated. And of course nothing stops one from designing a game that’s relentlessly hard (hey, Dark Souls II came out recently). Having laid out the dismantled innards of the humble RPG, we can have a look back and D3 and see what may be dissatisfying for players. My hypothesis is that Diablo 3 currently has too little progression (or sense of progression) because of its overemphasis on items. That is, too much progression is tied to finding gear. Allow me to elaborate. I argue that of the four progression systems we see in the traditional RPG, only one remains in Diablo 3. 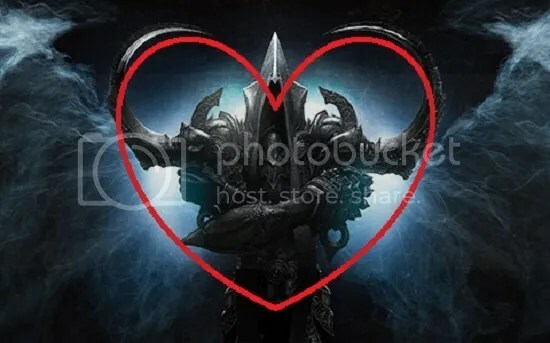 Obviously plot progression is over once you defeat the final boss of Reaper of Souls. You can still go back to the campaign and do it again, but for all intents the bulk of the content of RoS is adventure mode. As it is, RoS incentivises players to play rifts again and again. That kind of repetition is Diablo formula, of course, but do note that this repetition does preclude a progression of player skill; there’s only so ‘good’ you can get at this low-ceiling activity. Even build design, another form of ‘skill’ (admittedly one you can just copy from the internet) is tied largely to getting the right gear. Furthermore, because so many stats are acquired from gear, there is very little to gain from levelling post-70. Paragon levels at most supplement your gear; they do not offer new options and cannot really get you into harder content. This makes dropping gear overwhelmingly the predominant method of progression in D3. Diablo 2 had a gear emphasis as well, but it also had two powerful tools that D3 does not: trading and skill points. Trading allows the D2 player to feel that he or she is always making some kind of progress with his gear just by dropping gold, bits of gems, runes, or unneeded gear because those can be converted into wanted gear. It’s like dropping fractional amounts of what you want, and every time that happens the player gets a feeling of progression. Skill points, on the other hand, makes one feel that they are making progress with their skill build even if in the grand scheme a single point is not worth that much. Each point gives a small hit of satisfaction up until max level when you finally ‘complete’ your skill allocation. Even if the effect is largely illusory aesthetically it still feels better for the player levelling up in D2 compared to D3. This is basically the effect gear determining build instead of vice versa. Now, having interesting sets and legendaries that can completely define your build is not necessarily a bad thing. Allowing players to do crazy things is great; we enjoy that. However, some of these pieces are incredibly rare and one has to be very lucky to acquire them. At some point players hit a plateau in gearing. And without trading or skill points, nothing a player does up until they luck out gives any sense progress. Now, I’m not saying to bring back trading or skill points. I’m saying that Blizzard needs to recognise their two-fold problem: all sense of progress is subsumed by gear drops, yet some gear is much too rare and cannot be meaningfully worked towards. Usually when a game offers zero progression that means the game is done and we stop playing it and go do something else. Yet content obviously exists, albeit locked away by the tyranny of random lottery. This creates a frustrating gaming experience for a lot of players, who would frankly be happier people if they didn’t know that they can get a Kridershot or Wand of Woh and unlock a whole new build. I think if you design a game and to some your content is better off not existing then mistakes may have been made. Thankfully this situation is easily remedied. As we have discussed, progression systems have been played with since gaming itself and it is not difficult to come up with one that suits whatever purposes you may have. Even something as simple as, for example, being able to trade in Forgotten Souls for specific gear as a surrogate for trading between players. It doesn’t really matter what, so long as players feel that they are meaningfully working towards a goal every time they play.